What is Remote Monitoring Care? 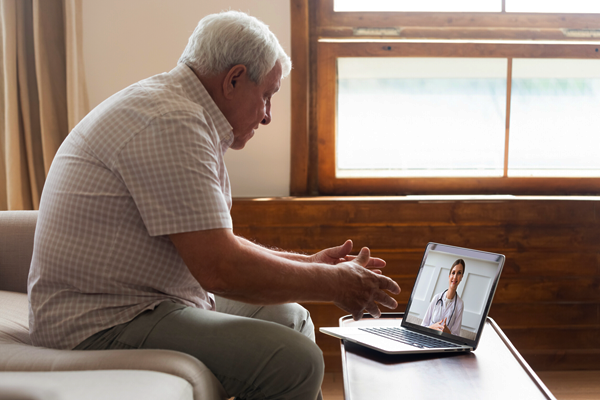 Home Remote Monitoring, also known as Care Coordination/Home Telehealth, is a service that allows the Veteran's physician or nurse to monitor the Veteran's medical condition remotely using home monitoring equipment. Veterans can be referred to a care coordinator for enrollment in Home Remote Monitoring services by any member of their care team. Enrollment is approved by a VA provider for Veterans who meet the clinical need for the service. A care coordinator gets health information that each Veteran provides through personalized questions answered on special equipment, and then checks in with the Veteran by phone, if needed. If any of the Veteran's health measurements do not seem normal, the care coordinator talks with their physician or nurse and then gets back to the Veteran with next steps. Am I eligible for Remote Monitoring Care? Since Remote Monitoring Care is part of the VHA Standard Medical Benefits Package, all enrolled Veterans are eligible IF they meet the clinical need for the service and it is available. Home Remote Monitoring can be used in combination with other Home and Community Based Services. There is no copay for Home Remote Monitoring services. However, there may be a copay charge when in-home video visits are provided in addition to standard Home Remote Monitoring services. You may need a phone line to transfer your health information to VA, however technologies are also available for mobile/cell phone connections. A video screen and camera, or video phone, may also be given to you so that the care coordinator can see you when you talk together. You would be able to turn the video camera off when you are not using it to talk with your care coordinator. Am I willing to use the Home Remote Monitoring technology provided by VA to provide my health-related information daily? Am I able to adequately see and/or hear in order to use the technology (or is there someone who can help me with this daily)? Am I ready and willing to fully participate in managing my health? If Home Remote Monitoring services seem right for you, talk with a member of your care team and then a care coordinator can help you to arrange for services. You can also use the Locate Services and Resources page, found on the left navigation menu, to help you find Home Remote Monitoring services. With Home Remote Monitoring I can check in with a nurse about my head injuries and the messaging system helps me monitor my depression. It's convenient because I don't have to go in to the clinic. Home Remote Monitoring helps my dad stay on top of his diabetes and hypertension because it monitors his blood sugar and blood pressure and it makes me worry a whole lot less.